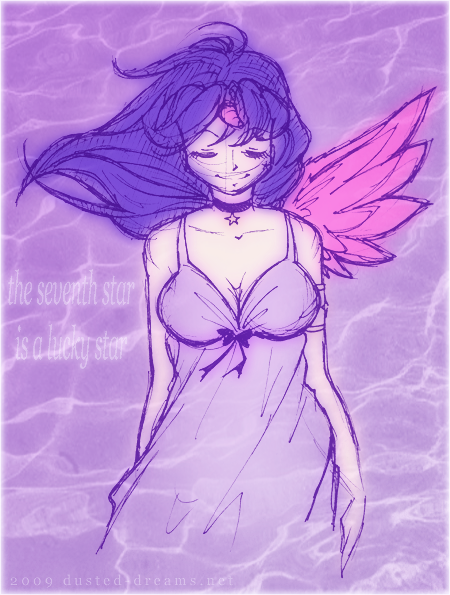 her full name is Estrella del Alba (pronounced "ess-tray-yah"), meaning star of the dawn. 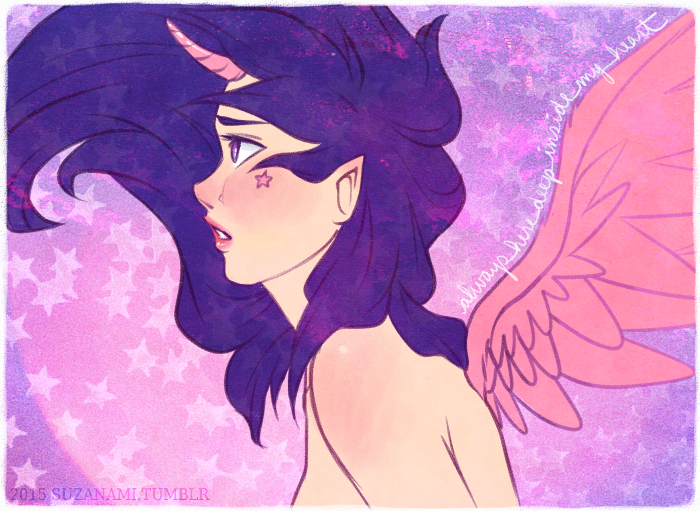 she's from an ancient tribe of unicorns who have the magical ability to shapeshift to human form. 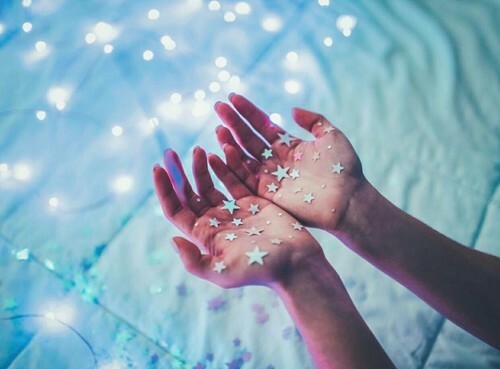 her mother, Charisma, fell in love with a human man and together they made Estrella, though her father was forced away from the unicorns long before she was born. she's very solitary and gentle but has a deep-rooted, earth mother sort of power to her. she is very fair-skinned with a full, curvy figure. she has lavender eyes. 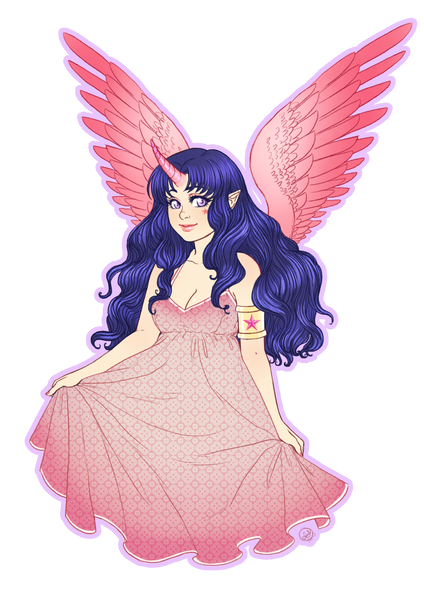 her navy/indigo hair is thick and can be wavy, always worn down and parted on either side of her horn. 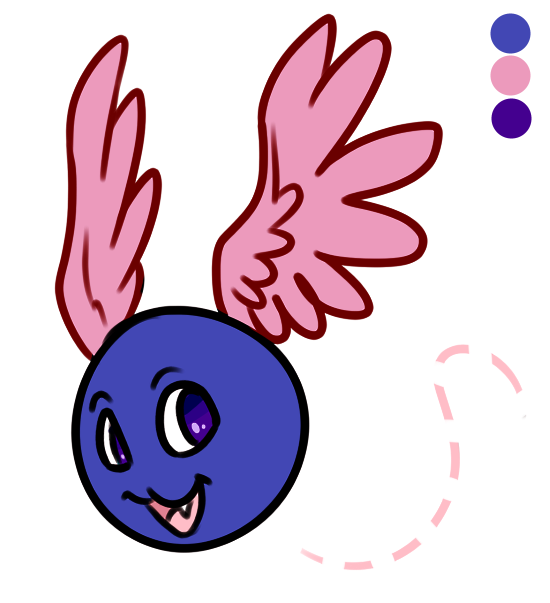 her horn is a soft pink color that matches her wings (which can be any size depending on composition of the drawing). 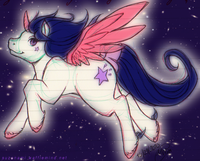 she has a long white unicorn tail with a dark tuft at the end which matches her hair color. there's a small purple star under her left eye. she always wears white or pale draping dresses and is barefoot. pointy elf ears are optional! 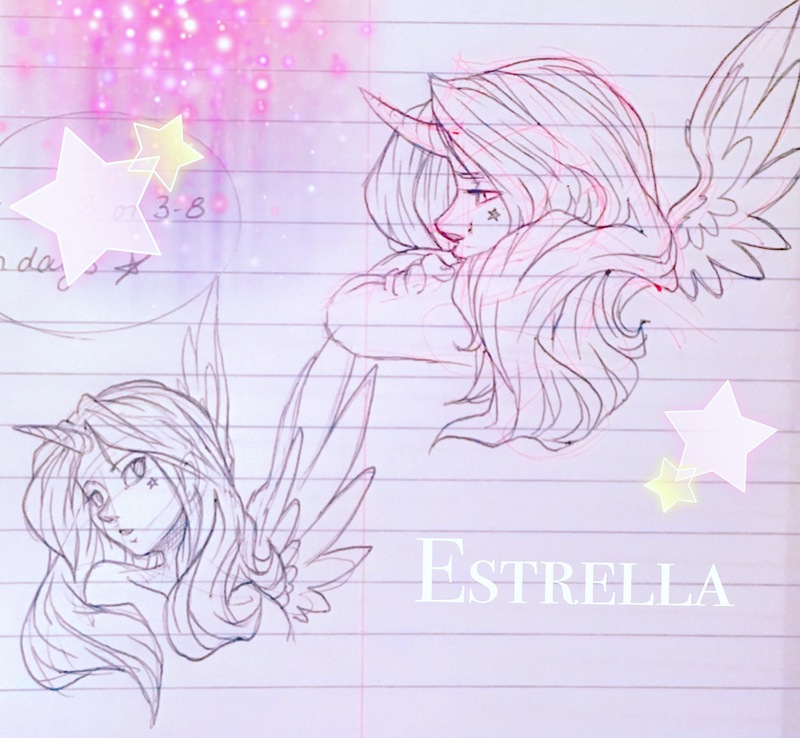 "stars fall at my feet, keep me grounded as I reach higher than I see"
Estrella was originally drawn as part of a fad on the Oekaki BBS I frequented in late 2001- everyone was making unicorn anthro girls so I wanted to make one too! I no longer draw her in her anthro form (though it's not out of the question) but now mostly draw her humanoid design. when I drew her more often, she was one of my most popular characters! she's still an incredibly sentimental character to me as she's been with me for so long and is attached to old friends from when I was a teenager. I sometimes use her for vent art. his real name and form are still a mystery. 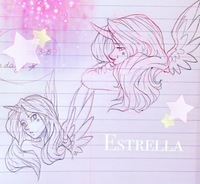 he's been with Estrella since she was a toddler and has yet to show his true form to her, but he is her protector and companion. he keeps his small form to conserve energy but he originally chose it to be less frightening to her. "Bii" is the nickname she gave him. 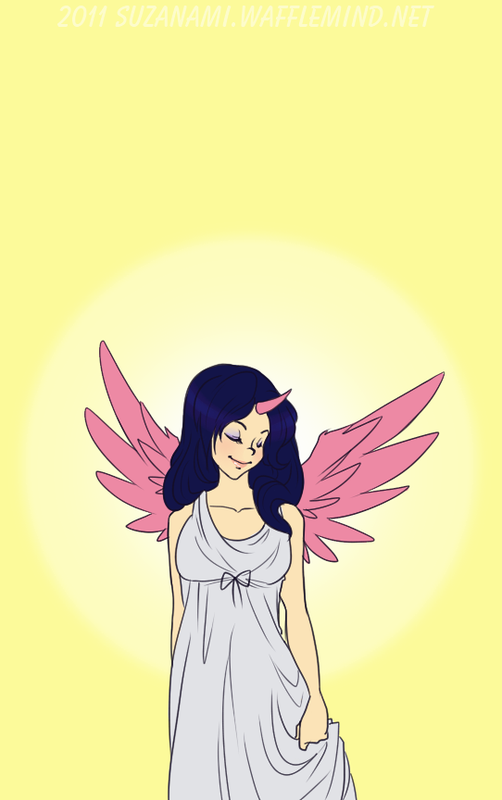 created by my old friend Carissa, Pyathia was (iirc) the daughter of the leader of the tribe of unicorns. 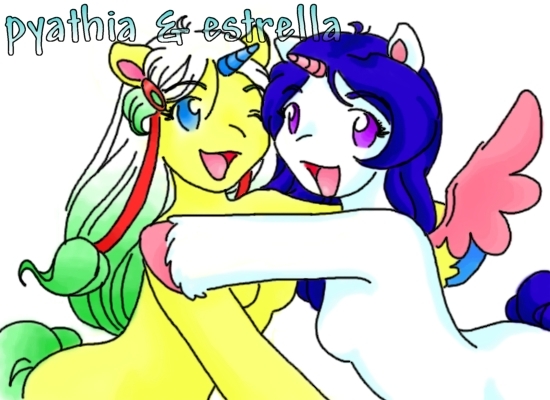 she and Estrella are extremely close. originally a chao character belonging to my friend Tony, Estrella met Hitoshi when she was young. they developed a deep relationship but parted ways a long time ago.